Local handmade ceramics from artist, Nikki Mizak. I create functional pottery that brings happiness, beauty, and something special to everyday life. I've always enjoyed those quiet moments in the morning, before the kids are awake and the world starts to stir. I like to make pottery that fills those moments with discovery and a little touch of luxury. Whether it's running my fingers over the slip trailed lines on a detailed mug, or admiring the brush strokes on a hand painted pitcher for pouring syrup on French toast. I find great inspiration in nature. 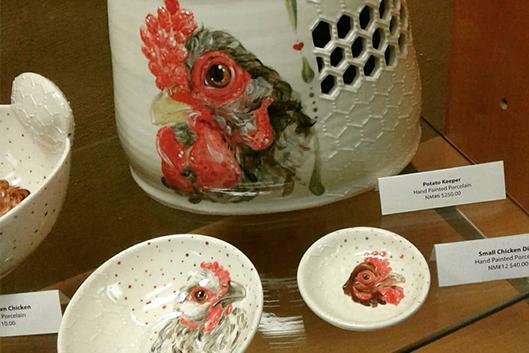 I feature chickens in a large portion of my work because I enjoy trying to capture their personalities on my pots. I love the way their feathers beg to be painted. Flowers are another love of mine, especially poppies for their historical tie to veterans. Along with my career as a potter, I'm also a wife to a soldier in the U. S. Army. Elements from vintage fashion, like buttons and lace, also influence my work. I often press unique pieces into the surface of my pottery to create interesting texture and pattern. Art has always been a huge part of my life; I remember painting in some of my earliest childhood memories. It was never a question of whether or not I would be an artist, it was a question of what kind of art I would create. Although I studied pottery in college, I earned my degree in painting and printmaking. Today, I draw from the skills I've learned by painting, carving, and altering my thrown pottery.